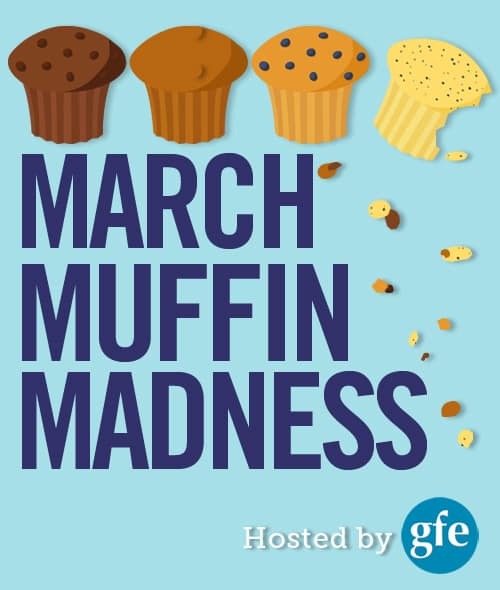 It’s another day of March Muffin Madness (MMM)! I love sharing the newest gluten-free muffin recipe from another wonderful blog and sharing the daily giveaways here on gfe! Today’s gluten-free muffin recipe comes from Lisa at Cook Eat Paleo. She is sharing Raspberry Chocolate Chip Muffins. 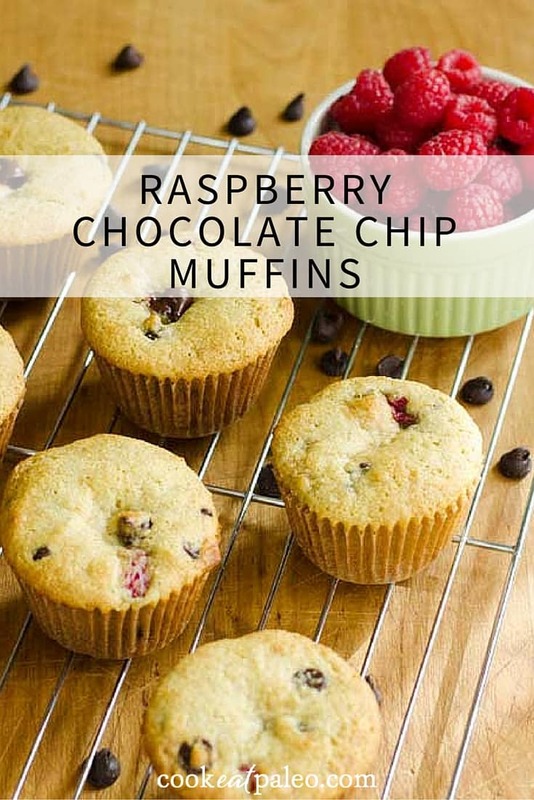 Lisa says: “Raspberries and chocolate are two of my favorite things—and they are amazing together in these muffins.” I don’t doubt the latter one bit, especially as Lisa’s recipe uses fresh raspberries and dark chocolate chips. Please also take a look at her Paleo Orange Blueberry Muffins recipe, a guest post here on gfe, which was in the Top 3 of the most popular recipes from the last MMM event. Okay, before you visit Cook Eat Paleo to get Lisa’s Raspberry Chocolate Chip Muffins recipe (and leave a comment there for an extra entry for the overall/grand prize giveaway), you’ll want to enter the daily giveaway below! 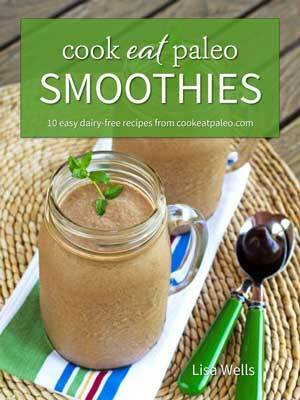 Today’s prize is Lisa’s own ebook, Cook Eat Paleo Smoothies. There will be three winners. I don’t know about you, but I’m always looking for smoothie inspiration. While we can certainly throw together a few ingredients in the blender, the results don’t always turn out as we’d expect, or like. Those are the times we wish we’d used a great recipe. Banana Bread Smoothie, Key Lime Pie Smoothie, Healthy Shamrock Shake, and more … Lisa’s ebook delivers! To make this daily giveaway even more fun–and to give you one of the ingredients to make Lisa’s muffins–there will be two more “surprise” prizes (which weren’t in the original prize listing) with one winner for each, so two more winners. The prize? 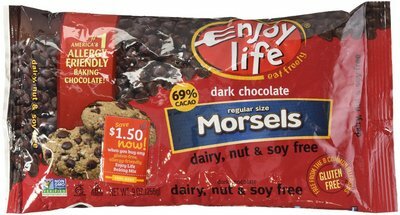 Packages of Enjoy Life Dark Chocolate Morsels! Hey, you might even win a fabulous blender—a Blendtec Designer 625 with Wildside+ Jar and Blender Jar+—for whipping up those delicious smoothies! There will be one winner for each of the prizes shown in the Rafflecopter widget below. Be sure to use the arrow to scroll through to see them all and then get all your entries! Rafflecopter entries and the comments on every post will all be part of the final drawing! I’m don’t really do paleo but these muffins look amazing and I can’t wait to give them a try! Who doesn’t love chocolate and raspberry together? Wow, the recipe looks amazing and so do the prizes! I’d love to win any of them! I would love to try the chocolate morsels! 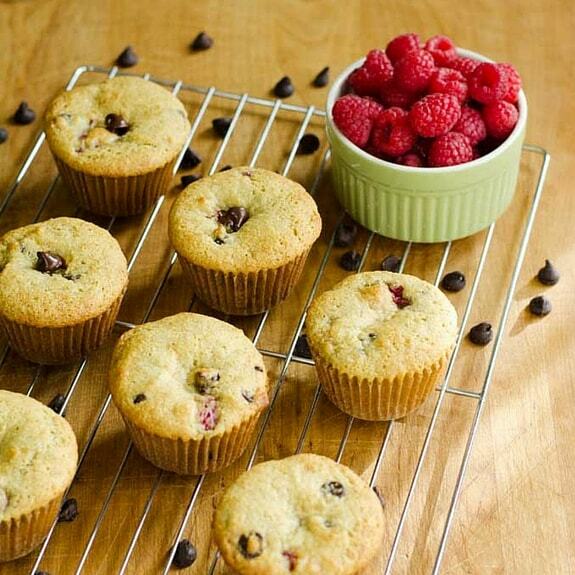 I want to try the raspberry chocolate chip recipe it looks simple and delicious. I love muffins! I love prizes! I absolutely enjoy March Muffin Madness! Almost my most favorite time of the year 🙂 And these raspberry chocolate chip muffins – swooooooooooooooooon! Smoothies, those are one thing I don’t make a lot of. I have maybe one recipe. It would be interesting to read the cookbook. I love Enjoy Life’s dark chocolate morsels! They’re my favorite chips for baking by far! I WILL LOVE MAKING THE CHEDDAR CHEESE MUFFINS AS I LOVE ANYTHING WITH CHEESE. These muffins look delicious. I love the combination of chocolate and raspberry! I love that the enjoy life chocolate chips are soy-free and non GMO. I would love to win those. I’ve wanted to try those chocolate chips for a long time. Anything with chocolate is good for you, right? I would love to try those chips.